Today, we’re excited to announce a tool that you have been asking for: You can now edit your artist bio in Spotify for Artists. For a long time now, we’ve been sourcing your “About” page from our friends at Rovi, who supply us with artist biographies. But we know that sometimes you want to speak directly with your fans, and tell them who you are. It’s a part of our overall commitment to giving you more and more control over your presence on Spotify. Here’s how it all works. As of today, all artists, managers, and and their teams can edit and publish their own bios straight from the Profile section of Spotify for Artists. You’ve now got 1500 characters to tell your story to your fans. The bio updates as soon as you hit save, and you can also link your page to your Wikipedia, if you’ve got one. Write whatever you want! We recommend a creative bio that helps fans get to know you better, but seriously go nuts. Link to anything on Spotify. You can paste Spotify links directly into the text field, or just use the @ symbol to link to whatever you want—artists or albums that inspire you, or playlists you’re featured on, or other artists you’ve collaborated with. Add a link to your Wikipedia page for fans who want to dig deeper. What you do with this space is entirely up to you. When we opened this up to a handful of artists for the first tests, we saw them use this space to share their story, the inspiration behind their latest release, or the most up-to-date version of their bio. The Peach Kings gave us a great overview of their major influences. Dan Snaith of Caribou used it to speak directly to his fans in the first person. 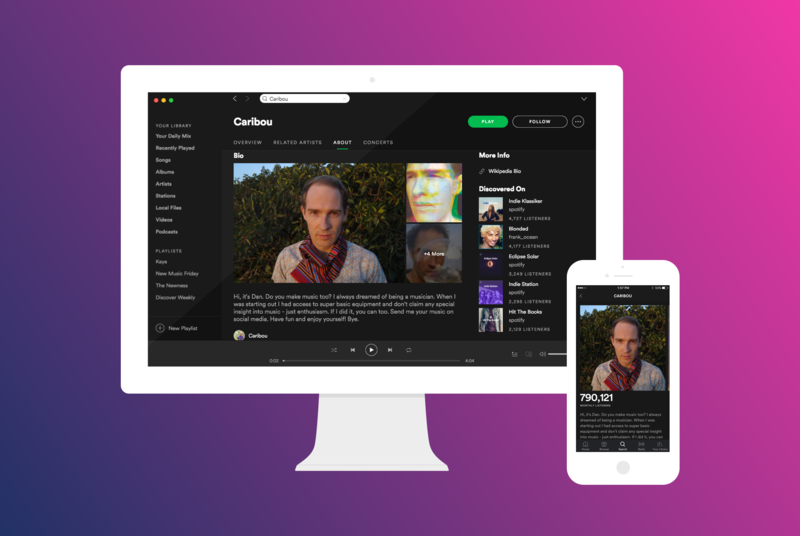 Here's how Caribou's new bio looks on desktop, and mobile. One important note: If you’ve currently got a Rovi bio, once you add your own bio description, you can’t get your original Rovi bio back. As with all content, your bio needs to follow our guidelines. But most importantly, have fun. We know your story changes over time. Now whenever you make a move, you’ll be able to share it with your fans. And as always, if you ever need anything at all, we’re here to help. *If you haven't yet, get signed up for Spotify for Artists right here.